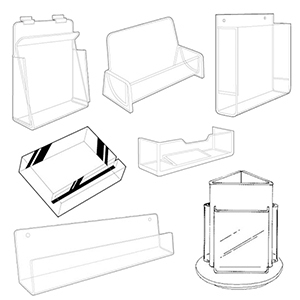 Dimensions: 1" x 3/8"x 1-1/4"
Acrylic 1-Pocket Delux Brochure Holders, 4" x 9"
Acrylic 1-Pocket Delux Brochure Holders, 8" x 11"
Dimensions: 1-3/8" x 1" x 2-1/8"
Dimensions: 1-3/8" x 1" x 1-1/2"
Acrylic J Racks Shelves for Slatwall with open ends, 24"
1-Pocket Acrylic Brochure Holders for Countertop, 4" x 9"
Acrylic Slatwall Literature Holder, 4" x 9"
Acrylic Slatwall Literature Holder, 8-1/2" x 11"
1-Pocket Acrylic Brochure Holders for Countertop, 8.5" x 11"
Acrylic J Racks Shelves for Slatwall with open ends, 12"
Acrylic J Racks Shelves for Slatwall with closed ends, 12"
Dimensions: 35.75" x 2.5" x 1.5"
Acrylic J Racks Shelves for Slatwall with closed ends, 24"
Acrylic Wallmount Literature Holder, 8-1/2" x 11"
Acrylic Shelves for Slatwall, Slatgrid with open ends, 11" x 4"
Acrylic Single Pocket Wallmount Brochure Holders, 4" x 9"
Acrylic J Racks Large for Slatwall, 24"
Dimensions: 1-3/8" x 1" x 5"
Dimensions: 23.75"x 2.5" x 1.5"
Acrylic Single Pocket Wallmount Brochure Holders, 8.5" x 11"
Acrylic J Racks Shelves for Slatwall with open ends, 36"
Acrylic J Racks Large for Slatwall with Tilt, 24"
1-Pocket Acrylic Brochure Holders for Countertop, 7.5" x 9"
Dimensions: 8" x 14" x 3.5"
Pocket Size: 3-1/2" x 1" x 1"
Pocket Size: 4-1/8" x 4-1/8" x 1"
Literature display made of acrylic is perfect for getting your literature seen. Here youll find triple pocket brochure holders, molded literature holders, single pocket brochure holders, acrylic countertop double pocket literature holders, acrylic slatwall book displays, sign holder with a literature pocket, sign holder with a business card holder, revolving literature dispenser, double pocket acrylic brochure holder, ship flat brochure holder, add a pocket brochure holder, deluxe hold it literature holder, outdoor literature box, and multi tier and multi use acrylic brochure holder. We also design and produce custom acrylic displays. Just give us a call at 800-426-5708 for more information.